A three-day Academy class on this topic was held in December 2007 at the Foundation's Main Center in Temecula CA. While the recorded program was not published, the opening commentary and discussion presented valuable teaching material on principles central to our understanding of A Course in Miracles, and so we are making them available here. 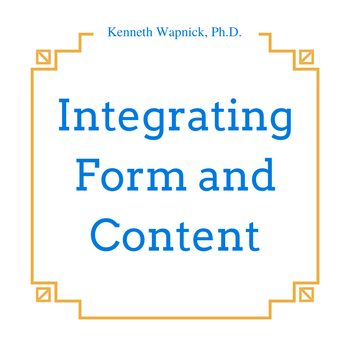 The integration of form and content parallels the Course's integration of its non-dualistic metaphysics with practical guidelines for living in the world of illusion. Jesus teaches us that as long as we identify with the physical/psychological self we call by our name, we need to use the world's forms or symbols—our special relationships—as a classroom in which we learn to recognize the existence of the decision-making mind, with power to choose the ego or the Holy Spirit as our teacher: the one emphasizing form at the expense of content; the Other using form to change the content.